If you want to make sure your company isn't drowning in data or wasting a ton of money on marketing technology it doesn't need, Michelle Robbins is the woman you want to talk to. She's the former Senior Vice President Content and Marketing Technology for Third Door Media, and previously also served as their Editor-in-Chief for three publications: Search Engine Land, Marketing Land, and MarTech Today. She's also a writer, a speaker, and a marketer. Seven months ago she launched Betagirl consulting. She works with both B2B and B2C companies, analyzing their needs and data to help them improve their MarTech platforms, develop data-informed growth strategies, launch competitive content marketing strategies, and get ahead of their competition. Naturally when we touched base, she had lots of terrific things to say about all of these issues. Some of this advice could very well save your company a whole lot of money. Check out our interview below. Carmen: You've seen the MarTech industry grow significantly over the past decade, what are some of the best and worst things about the industry? Michelle: The best thing is the industry continues to grow and evolve. A decade ago, people were focused primarily on either marketing or technology. Now we've come to understand the two share a symbiotic link. The less positive aspects I see surface surround issues of gatekeeping - the “who decides? CMO or CTO?” which is honestly why having the CMT (Chief Marketing Technologist) role - especially in larger organizations - can be critical. Carmen: What do you love most about Marketing Technology? Michelle: What I love most is the ability to use my full range of skills. I have a background in traditional marketing, digital marketing, and am also an engineer. Working as a marketing technologist enables me to flex all of those muscles and cross disciplines more easily. Carmen: What are some of the most mature types of applications and solutions that can benefit companies, and how are they being used by large brands and smaller businesses respectively? Michelle: In my experience, CRMs have matured the most, and offer the best ability for small and large businesses to scale 1-to-1 marketing. Related, the maturation of APIs across different pieces of MarTech that enable tighter integration into an overall stack has been impressive. Carmen: What types of businesses are adopting MarTech the fastest, how are they using it, and what's your recommendation on whether a company has the operations and infrastructure to be worth it? 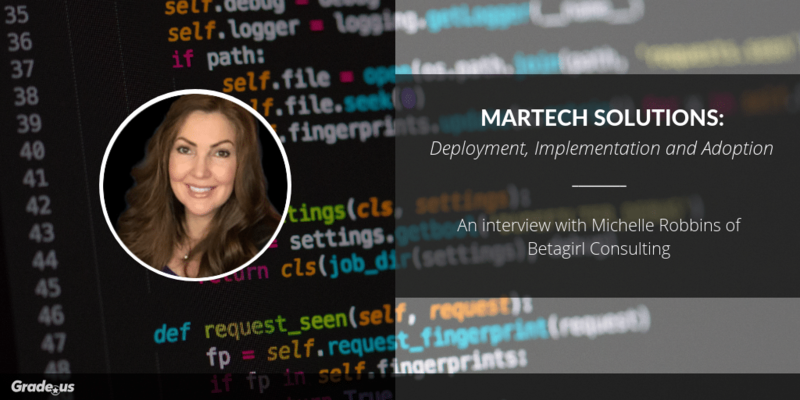 Michelle: When you consider that there are over 5,000 technologies that have been identified as within the scope of “MarTech,” it’s safe to say all businesses are adopting some type of MarTech for use within their organization. Whether or not a company has the operations and infrastructure to support any given piece of MarTech relates directly to the use case and complexity of a given selected technology. As a basic example, Wordpress is considered MarTech, and is arguably very 'plug and play' as a blog or site CMS. Yet many companies struggle to commit resources to it. Imagine those same companies adopting something along the lines of IBM’s Watson Marketing platform. Carmen: Is there such thing as MarTech bloat? Do you have recommendations for businesses to keep their MarTech stack lean? Are there essential solutions that need to be included? Michelle: MarTech bloat is definitely a problem. And it’s less related to there being too many tools, than it is to there being too many departments making decisions on application adoption - especially as so many tools require less and less technology resources to adopt and utilize. If you don’t have a ‘central clearing house’ for technology adoption across an organization, you’re more likely to see situations where a company has adopted multiple technologies that have similar features. For example one department using MailChimp and another using Marketo for customer email marketing. As for essential solutions, that’s going to vary greatly by the type of business model. Easy to argue however that any business that has customers needs, at a minimum, a CRM and an analytics platform. Carmen: Who should be the stakeholders when evaluating marketing tech vendors and what should businesses be looking for in their vendors? What does a 'healthy' evaluation process look like? Michelle: The stakeholders for vendor evaluation should include representatives from the departments that will be utilizing the technology, as well as representatives from the IT department. It’s crucial to involve IT in the beginning (vs. at the end, after a vendor has been selected), because there may be considerations outside of features, functionality, etc. that impact the ability to adopt a given piece of technology, that marketing or other stakeholders won’t be aware of - but your tech team will. They'll also know if there's an existing technology in-house that can solve the problem, which would eliminate the need for new tech. A healthy evaluation process also starts with defining needs and tying those to company goals, which is also critical for getting budget approval. The complexity and time involved in this process will vary based on the complexity (and often costs) of technology being considered. Carmen: As more businesses adopt marketing technology solutions, what are the best practices for both implementation and adoption? Whom in the organization should be spearheading the implementation, and who should be spearheading adoption? Michelle: The spearheading of implementation and adoption will be led by the same high level stakeholder team that selected the technology (typically this will be the marketing, sales and IT leaders). It is incumbent upon them to work with their teams to ensure all aspects of both implementation and adoption are successful. Otherwise, they’ll have spent a lot of time, and likely a lot of money, and not see returns for their efforts. Often, and if working with an outside consultant, the primary point person in this regard to work across all stakeholders and teams, is the consultant. In such cases, the consultant works hand in hand with the teams to ensure success in the project from start to finish. I’ve seen it happen often where companies will rely upon account execs from the vendor to fill this role - that rarely works well and is never efficient. Carmen: Once everything has been implemented, in many companies there seems to be a struggle for adoption. Why do you think that is and how can that be prevented? What are some strategies and tactics for effective adoption? Michelle: It’s interesting because often, the technology itself becomes the scapegoat when, as you note, it’s the adoption that failed. And there are many factors that contribute to this common problem. One is having no internal advocate for the platform. Another is failing to dedicate the resources to train the core users of the platform. Insufficient understanding of how to tie a given platform to other points of data or tech already in use can cause the adoption to fail as well. So can human nature. Often, it's just easier to keep doing what has always been done than it is to adopt a new way of doing something, or to use a new system. All this can be prevented by ensuring that a priority is placed on adoption as part of the overall project plan. Often the planning ends at “install the software” and assumptions are made about who will use it, how it will be used, how it will be integrated into existing processes. Incorporating a very specific and detailed plan of how the company will adopt and utilize the new technology - who will be the primary admins? I'm not just talking about a tech person or an IT person. I'm talking about having a highly trained power user. You need a point person either internally, or as a consultant, who will work to ensure every user is trained properly. To incorporate the new tech into their workflows. This is critical. Also critical: you need to put timelines and measurable milestones into place to move towards a successful adoption. This has to happen before the tech is installed. Carmen: As an analytics and data guru, what role does data play in marketing technology, and what steps should companies take to use the data effectively? Michelle: Data is everything in marketing technology. The platforms exist to enable better data capture and analysis. But you only get out what you put in, and businesses easily become overwhelmed because everyone is capturing everything. Not all data is valuable - or even necessary. So making sense of what is and what isn’t becomes the trick. When consulting, I first look at the business operations - what are they trying to succeed in doing. Then I look at what data they are capturing, and, as is often the case, what they're not capturing. I look at whether the way they're using that data enables them to derive the insights and information needed to grow their customer base, or to improve their product or service offerings, or otherwise to allow them to develop meaningful insights. From there, it's a matter of making course corrections where necessary. There are many pitfalls, though they depend on the type of business and the business model we're looking at. Just remember the "3 Rs" apply to everyone when considering the data you're collecting, and those are recency, relevancy, and robustness. Carmen: When you provide digital strategy and marketing technology consulting services, to what extent are you focusing on strategy, versus operations, versus technical implementation? Michelle: It honestly varies depending on the needs of the client - how large or small an enterprise, and their own in house resources. Carmen: What types of businesses do you work with, and how do you help them? Michelle: I work with businesses across verticals - there’s no one “type” I specialize in or focus on. Their needs likewise vary - an SMB that has an ecommerce site will have different needs than a local service oriented business compared to a large multi-location corporation. It really just depends. When I first consulted in the early 2000s, my work was dominantly focused on developing web applications, front and back end technologies and integrations. These days, it’s a lot of content and overall digital strategy, gap analysis, auditing, and formulating strategies to identify whether to build or buy, etcetera. It goes from there to deeper engagements such as high-touch servicing from strategy all the way through to implementation and adoption. Carmen: To pivot a little, you're very committed to engaging more women in STEM fields. In the last 3-5 years, are you seeing more women emerge as Data Scientists, Marketing Technologists and Digital Engineers? What needs to happen to continue that momentum? Michelle: That’s an interesting question - because I do feel like I’m seeing more women in these fields, but I don’t know if that’s because there are more or because I am being intentional in seeking out these voices and practitioners. There are confounding variables at play definitely. To continue building momentum, I think it’s incumbent upon those of us in the field that can be visible and have opportunities to speak at conferences to continue do so - and bring other women in the field along with us! Carmen: How can we empower more women to pursue careers in STEM? Michelle: We can be advocates, sponsors, and mentors. And this applies to men and women. Possibly it’s even more important that men join us and become allies in achieving this goal. Carmen: Can you talk a little about the different organizations you work with? How can employers improve the culture in the workplace for women? What specific programs or day to day practices can they implement to enhance the experience? APCH.org, A Place Called Home, is one. This non-profit in downtown LA provides after-school enrichment programs for low income families in the neighborhood, and includes a Girl Power program for their high school aged girls. I’ve given presentations to the group, as well as being paired with a student through their “Life Mentor” program. I firmly believe “You can’t be what you can’t see” so being a visible woman in tech to young women is a priority for me. I also worked with colleagues in our industry to get another young woman into a cohort of the Girls Who Code program. She spent the better part of a summer up at Stanford learning how to build an app. That program has expanded to many areas of the country and is doing terrific work with women in high school. I’ve been a member of WITI, Women in Technology International, for over 20 years now and have conducted a webinar for the membership as well as spoken at and moderated a panel at their annual conference. It’s a terrific—and large—group that has monthly events throughout the company via local chapters. I’ve also had the honor of conducting the programming and moderating the panelist discussions at several of the inaugural “Janes of Digital” events that Bing sponsors for women in search marketing. These are likewise held at a variety of search marketing events throughout the year and a terrific opportunity for women to network and share experiences and tips for career growth. But really, the best thing people can do—men and women—as day-to-day practices in the workplace is to support one another, be curious, be responsive and be supportive in any way you can. Through mentorship, sponsorship, or just lending a hand to a colleague to help keep them on a path of growing and learning. You never know if you’ll be the one person that made the most difference, but it’s worth taking the shot. Carmen: How can businesses work with you? Do you have any initiatives in the works that you can share with our audience? Michelle: At the moment—because I’ve only recently decided to consult again and have already engaged clients—reaching out via my LinkedIn is the best way to open discussions of how I can help. In between consulting and data science courses, I do need to get a website up and refreshed. There’s just not been the time yet. I can’t comment on my current engagements and initiatives with clients, but something that I do have in the works that I am personally excited about is having begun the journey to becoming a credentialed data scientist. I am looking at and applying to an executive part-time Masters in Data Science programs that will begin in the Fall of this year. So maybe check back with me in 2 years and I’ll have a whole new set of experiences—and a new path—to share!